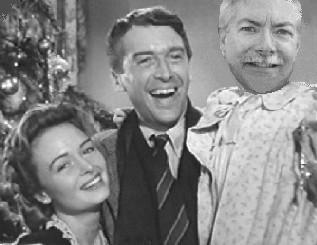 Unless you’re a) stranded on Exile Island, b) in a persistent vegetative state, or c) Amish, you’ll probably see one of the three hundred showings of It’s a Wonderful Life this holiday season. The 1946 film starring Jimmy Stewart, tells the story of George Bailey: a man with lofty dreams who is stuck in the “crummy little town” of Bedford Falls and conscience-bound to run his late father’s “penny ante” savings and loan. It’s more than just a sappy, sentimental movie, it’s a valuable lesson in ministry. For instance . . .
Every pastor worth his or her ordination certificate, dreams of pastoring a mega church with a TV ministry and best-selling book. We have a vision and a ten-year plan. I know what I’m gonna do tomorrow and the next day and the next year and the year after that. George Bailey. But like George Bailey, 99.9 percent of us are stuck in a “crummy little town” with a church attendance of less than 100. (The national average is 124.) And so, we get discouraged, and perhaps despondent. A man down on earth needs our help. . . . He discouraged. At exactly 10:45 pm tonight earth time, that man will be thinking seriously of throwing away God’s greatest gift. Franklin, a senior angel. George discovers that his seemingly insignificant life has saved the lives of hundreds of soldiers when he saved his war-hero brother from drowning as a boy, saved the life of a family (and kept the town druggist out of prison) by discovering poison in a prescription, kept his uncle from losing his mind by keeping him from losing the family business . . . and the list goes on and on. Your article [on suicide] saved my life tonight and showed me a path toward hope. I have very little words to say, still in severe pain from the death of my boyfriend six months ago. But I felt a need to say thank you. And so, my Christmas wish for you this season, is that God will give you a glimpse of the impact you have had on lives here on earth and for eternity: marriages that have been saved because of your counsel, those addicted to vices who have been delivered because of your prayers and support, young men and women who have been called into ministry because of your influence, people who have been “conformed to the image of Christ” because of your messages, lives that have literally been saved because of your prayers, and—most of all—people who now have eternal life because of your influence. Without you, not one of those lives would have been changed!